The Rising Tide Has Come! It's finally arrived! Flurry's 5th novel! Join Flurry on an epic pirate adventure. It's his most exciting and action packed adventure yet. It's 266 pages of nonstop suspense to keep you on the edge of your seat from cover to cover. Click the image below to be taken to Amazon to learn more about it. I've been working hard on my books, eBooks, the website, and many other "secret" projects. Lately, I've been doing little tweaks to the different pages here on Flurry's official website. Today I thought I'd play around with the logo just a little bit. My goal was to simply straighten it up and make the lines more crisp. One thing led to another and now I have the image below. I guess I have a new logo? I think it looks pretty cool. 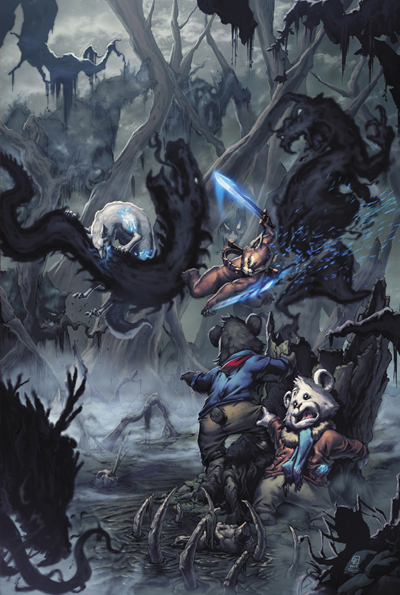 Flurry is both drawn and colored by Luís Figueiredo, in this image. The time has come to reveal one more of my projects. I just finished up The Chronicles of Flurry the Bear. It's the first of a three volume set. Inside this 638 page book are the first four Flurry the Bear novels, a short story, and an extensive prologue to Flurry's upcoming novel named The Rising Tide. It's cheaper than buying all four novels and it includes extra content. It's the perfect book to buy in order to get you all caught up in time for the release of the fifth novel in the series. You can click on the image below to be taken straight to it. In other news, I've been gradually changing the website and updating a lot of it. There are many more renovations at hand. I'll make the big announcement here, when it's all done. There are some other cool things being worked on that I hope to share with you soon. Well, it's been a while since I last wrote an update. Man, have I been busy! I have so much to share with you, but it's been kept secret for some time now. I can only give you a little glimpse, for right now. More to come later, so stay tuned. I will say there'll be many new reveals over the next three months. My artists and I have been working on many different projects. I haven't posted much "yet", but when I do, you'll be just as excited as I am. If things go according to plan, there could be four different publications for Flurry the Bear, coming soon. They're each different from one another. One of those very items will surely be Flurry the Bear novel #5, known as The Rising Tide. It's a pirate adventure that reunites Flurry with Chingu and Drizzle. 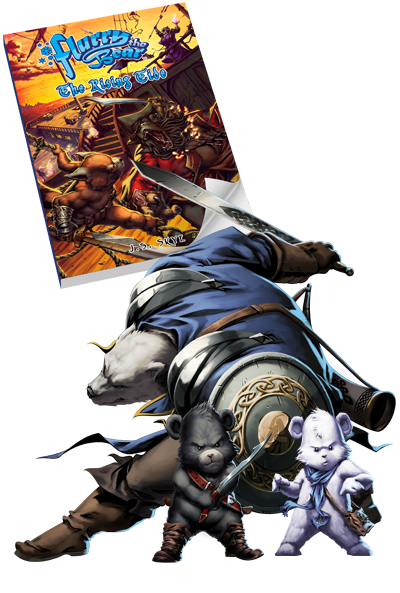 There are many new characters, such as Chingu's brother Shinyuu and the dueling pirate captains Black Bear'd and White Cloud. 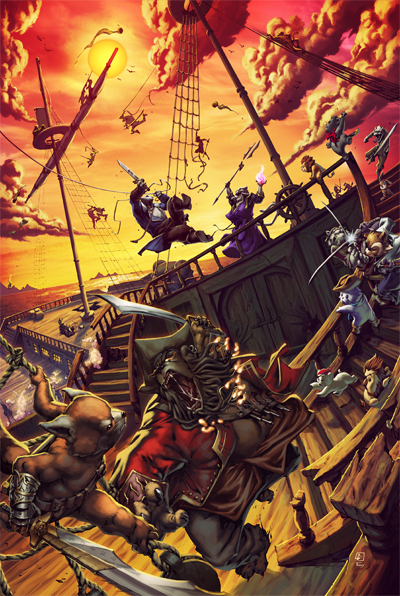 This pirate adventure is ACTION PACKED! The book literally starts with a BOOM! (You'll see what I mean by that when you read it.) The book has been finished for quite some time now. The release has been delayed purposely in order to release it around the time of my next Kickstarter campaign and slightly "after" a special surprise I hope to reveal in a couple of weeks. Yes, my team and I are re-launching our Kickstarter in July for the comic book named The Tempest Wind. Our first go at it wasn't successful, but we listened to all of the feedback, comments, and e-mails. We learned that most people JUST want the comic book, so we're restructuring our reward tiers, releasing new art, and making less expensive options. If our funding goes well this next time around, as we're confident it will, this comic book could turn into a series. What happens will depend on the fans. If you love it as much as we do, there'll be great things in the future for the comic book series. Today is an exciting day. The Rising Tide's cover art was featured today on Deviant Art's website. That was unexpected and exciting, too. Have you seen it yet? I'll have more to share soon. 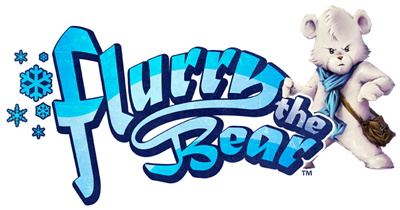 I really can't wait to unveil all of the cool Flurry the Bear stuff. It's that excitement one gets when they purchase a really cool gift for someone and they can't wait for them to open it.